David Ponder is back--and this time, the fate of mankind may be in his hands. This is humanity's last chance. Centuries of greed, pride, and hate have sent mankind hurtling toward disaster, and far from its original purpose. There is only one solution that can reset the compass and right the ship--and that answer is only two words. With time running out, it is up to David Ponder and a cast of history's best and brightest minds to uncover this solution before it is too late. The catch? They are allowed only five tries to solve the ominous challenge. Readers first encountered David Ponder in the New York Times bestseller The Traveler's Gift. 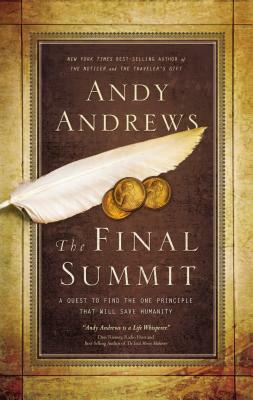 Now, in The Final Summit, Andrews combines a riveting narrative with astounding history in order to show us the one thing we must do when we don't know what to do. "Every generation or so, God produces a person who can communicate like no one else. His words are like cool water to a thirsty civilization. Andy Andrews is one of the best I have ever seen." "Is it possible to mix C. S. Lewis, Alfred Hitchcock, and Tony Robbins? The Final Summit is a unique and powerful blend of mystery and suspense and principles and emotional fire. Wow Bring your highlighter to this party. You'll want to remember every word "